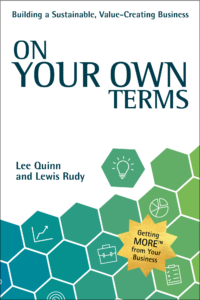 On Your Own Terms: Building a Sustainable, Value-Creating Business will change your professional life on a scale you can’t begin to fathom, using the MORE (Master of Reverse Engineering) process. Cathy, you instilled the confidence in me to make my dream of writing a book come true. Your guidance in On Your Mark was spot-on. Thank you for your leadership, patience, and advice. Here is to many more years of helping other aspiring authors see their dreams come true!